Films like A Walk in the Woods basically sell themselves. In the grand tradition of The Best Exotic Marigold Hotel (first and Second), Last Vegas, The Hundred-Foot Journey, et al., its main promotional hook is appealing to a certain age by actually casting actors of a certain age. It’s hard not to understand why they tend to find their audiences, even if they’re sometimes lacking in virtually any other appeal. That much being said, the prospect of Robert Redford and Nick Nolte going on a hike along the Appalachian Trail is pleasant enough on its own, and the trailer — while hardly a great piece of work; “Walk of Life”? seriously? — sells this as a worthy collaboration. Notwithstanding the fact that more or less everything is given away within — because, sometimes, your audience wants to know exactly what they’re getting — and that were were not fans of this when it played at Sundance. As was said, it “is underwhelming in nearly every facet, particularly the script, which just leaves the two stranded, and the same goes for the filmmaking. We don’t get to see them experiencing these environments enough, nor do they ever have any impact within them in any meaningful way.” So perhaps we’re being misled! 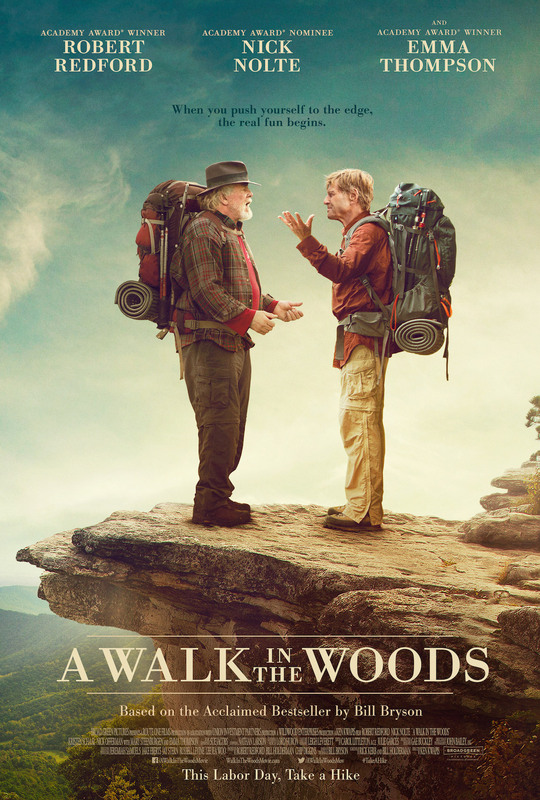 In this new comedy adventure, celebrated travel writer, Bill Bryson (Academy Award winner Robert Redford), instead of retiring to enjoy his loving and beautiful wife (Academy Award winner Emma Thompson), and large and happy family, challenges himself to hike the Appalachian Trail – 2,200 miles of America’s most unspoiled, spectacular and rugged countryside from Georgia to Maine. The peace and tranquility he hopes to find, though, is anything but, once he agrees to being accompanied by the only person he can find willing to join him on the trek – his long lost and former friend Katz (Academy Award nominee Nick Nolte), a down-on-his-luck serial philanderer who, after a lifetime of relying on his charm and wits to keep one step ahead of the law – sees the trip as a way to sneak out of paying some debts and sneak into one last adventure before its too late. The trouble is, the two have a completely different definition of the word, “adventure”. Now they’re about to find out that when you push yourself to the edge, the real fun begins. A Walk in the Woods opens on September 2.